We love stacking bangle bracelets ~ especially if they are our Beloved Bangles! 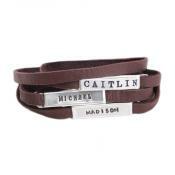 Mix colors and styles to create a personalized bracelet that is meaningful to you! The above price is for a bracelet with a bronze cuff and nameplate, price will change depending on the options you choose. 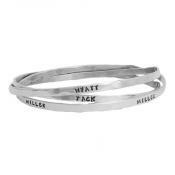 Stacking bangles are the perfect way to wear meaningful and stylish jewelry. Each cuff has a different design ~ you can mix and match metal colors and styles to create the perfect bracelet to fit you! 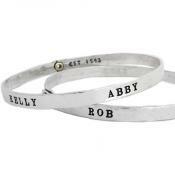 The personalized bracelets are stamped with a name, word or date that is meaningful to you! 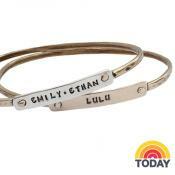 Wear your name, a bangle for each person in your family, or for each pet or grandchild! Personalized Stamps: Stamp each child's name on a different style bracelet and create a unique stacking family bracelet. Or stamp just one child's name, a birth-date, an anniversary date or an inspirational word. The price listed is for one bronze/bronze bracelet. 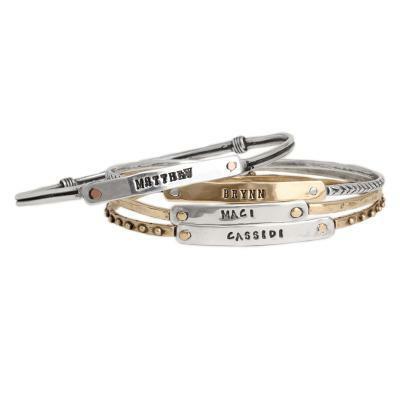 If you change the metal combination or add more bracelets the price will change. Nelle and Lizzy fonts can fit up to 11 characters per band. Block font can fit up to 7. The cuffs of the Dotted, Wire Wrapped and Chevron patterns are all the same size and the plates are different according to if you order a small or large. On the hammered style, the plates are the same size and the cuffs vary depending on what size you order. So if you are mixing styles, the stamped plate might vary in length depending on which style you order. The bracelets can be ordered in nine different metal combinations. Please note, the letters on the bronze nameplates do not darken as much as on the silver nameplates. Because of the customization, you can only order one bracelet at a time. If you would like more than one of this bracelet, click add to cart and return to this page to customize your next bracelet. All silver is sterling, the gold is gold bronze, the rose gold is rose bronze and the wire wrapped bracelet rivets are copper. Dimensions: The cuff pieces are approx 2.5mm wide. All silver is sterling, gold color is gold bronze the the rivets on the wire wrapped bracelet are copper. All of the cuffs are the same size, the size of the stamped plate varies depending on whether the bracelet is a sm/med (.2" x 1.3") or med/large (.2" x 1.5"). Sizing: All bracelets are bangles and slide on the wrist. They do not have any type of release to open and close them. Need help with bracelet sizing? Before ordering, we strongly encourage you to download the sizing guide and watch the video below for sizing instructions. We can not change the size of bracelets once they are ordered. We only use sterling silver or gold bronze in our products. I had my children pick out these bracelets for me for Mother's Day and they are absolutely amazing. I have stackable rings that I had got five years ago from this company and they have held up so well stayed polish extremely excellent. They're great in style and will never go out of style. Very reliable products and reasonably priced for a custom made piece of family heirloom. I love you Nelle and Lizzy you guys rock! I had ordered 3 of these a few years ago with my grandsons names engraved on them and have worn them every day since! I just had a granddaughter 2 weeks ago and ordered one with her name. I would highly recommend! I never take them off!